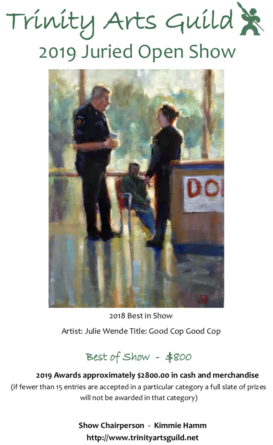 The Show is on display at the Trinity Arts Guild’s Gallery in Bedford. Closing reception and awards will be held on Monday, Nov. 5th prior to the monthly meeting of the Guild. Join the fun!! We will complete a 15″ x 22″ (half sheet) water color each week. The class explores color theory and design elements in abstract works, impressionistic pieces and experimental art. Subjects may include landscapes, florals, seascapes or abstracts. 2819 R. D. Hurt Parkway, Bedford, TX 76021 (inside the Boys Ranch Park) 95 pieces of art are on display. 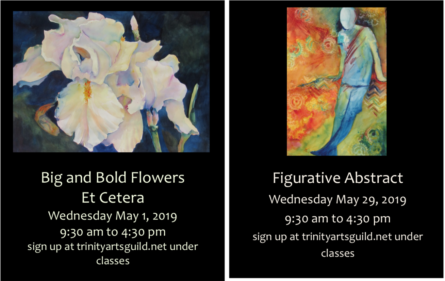 The next Trinity Arts Guild members meeting will be on Monday, May 7, 2018.